PEI mussel farmers lead the way in producing approximately 80% of the North American mussel production. The PEI mussel industry is a shining example of how nutritious and delicious food can be produced and harvested in a sustainable way. 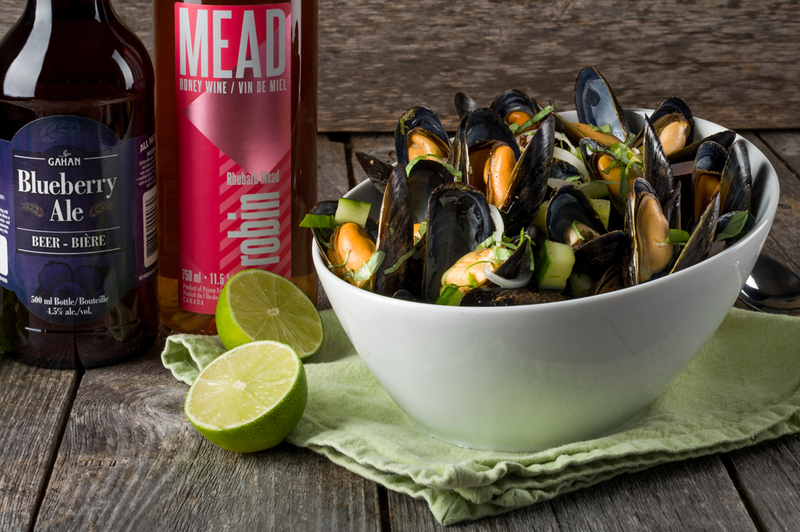 Health Fact } PEI mussels are rich in protein and zinc and are low in fat and cholesterol. Place mussels in a colander and rinse under cold running waterto remove any dirt or sand; do not submerge. the mussel shells have opened. serve with crusty bread to soak up broth. Chef’s Tip: If pairing with Honeydew Apiaries Robin Rhubarb Mead, replace Blueberry Ale with 1 cup of Honeydew Apiaries Robin Rhubarb Mead.